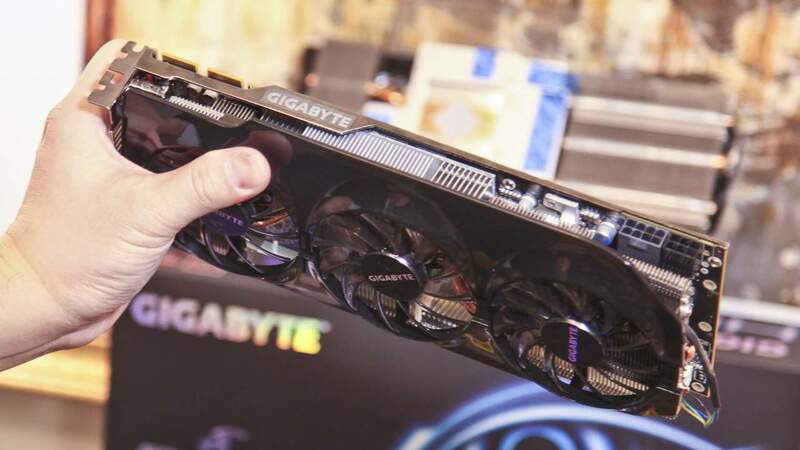 Our video coverage from the International CES in Las Vegas this year begins with a look at GIGABYTE. They were setup at the Venetian Hotel this year on the Vegas Strip and Futurelooks was on hand to talk to them face to face and show you what they have in store for us in the coming months. Check out our video above (or directly on YouTube) for the full meal deal interview with one of the faces of the company, Colin Brix. The latter part of 2011 was a rough time for GIGABYTE as they dealt with some Google Translate fails. A press release issued in Taiwan was incorrectly translated and that lead media from around the world to state that GIGABYTE was doing a huge recall and that a new BIOS was merely a band aid that not only covered up hardware issues. Not only that, but it was also reported that the BIOS (F7) prevented the boards from doing what GIGABYTE boards do best which was overclock. Colin helped us clarify what this meant for users and it turns out that the F7 BIOS is really just a fix for an exploit that a competitor took advantage of to damage their reputation. Essentially, it allowed the board to run above voltage spec and create the situation that occured in the very public video that circulated on YouTube and around the web. He told us that resident overclocker Hi Cookie immediately took his LN2 tanks out and shattered X79 overclocking records with their entry level X79-UD3. This was on the new F7 BIOS that supposedly crippled this functionality. 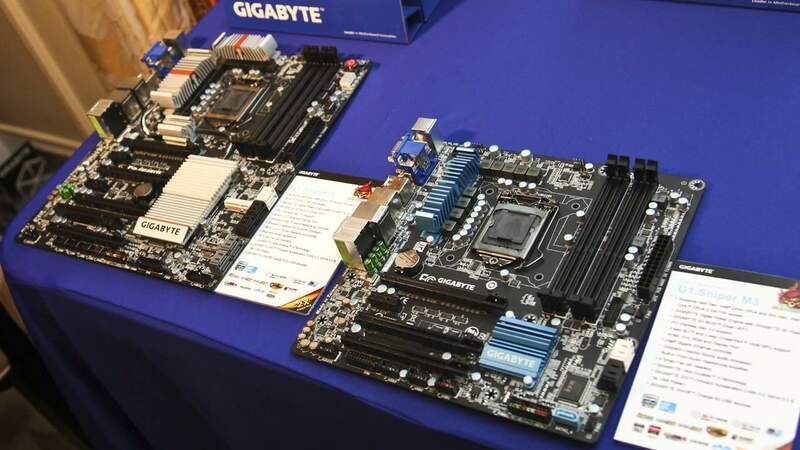 He reiterated that GIGABYTE stands behind their products and pointed out that GIGABYTE now offers a 5 year warranty on the new series of X79 boards which is industry leading. What a relief! New Intel Z77 Series Boards Due for Q2 2011! The new Z77 series boards built for INTEL's new Ivy Bridge processors are well under way in terms of development for GIGABYTE. Colin actually wrestled this whole series of engineering mock ups and test boards from the Taiwanese engineers to show us what they were working on. He told us as much as he could given the still secretive nature of the Ivy Bridge performance benchmarks. At the top end, the Z77 series is getting the G1.Killer treatment in the form of a new G1.Sniper 3 and a new mATX model dubbed the G1.Sniper M3. Both boards will have upgraded audio and networking just like the originals. The rest of the board line up will be filled out with a GA-Z77X-UD5H and a new GA-Z77X-UD3H. Of course this may change as they figure out how to fill out the rest of the line up for different markets. Unlike the the X79 series, the Z77 series will support Socket LGA1155 and will be backwards compatible with Sandy Bridge. However, the Z77 series will offer some new performance features that work with the new chip and just how much performance should come out in time. Also being shown off was one of their Z75 business boards called the GA-B75M-D3H. This board supports many of the remote functions that INTEL hard codes into the chipset. Things like being able to turn off PCs after employees leave, to remote access are all emphasized in this platform. GIGABYTE typically doesn't do a "reference" card design for any of their GPUs. They tend to take their time to produce something a little more special and their new HD 7970 is indeed special. It's clear that the new GPU from AMD is clearly a monster and this one will come to us with a brand new black PCB, a new Windforce III cooler tuned to deliver maximum cooling to this GPU, and will likely come overclocked right out of the box. Since the HD 7970 already maxes out the Catalyst Control Center overclock settings, it'll be interesting to see just how far they will push it when it comes to market in the next few weeks.